Backup, restore, and manage your iPhone contacts. Is there a better alternative to Backuptrans iPhone Contacts Backup & Restore? 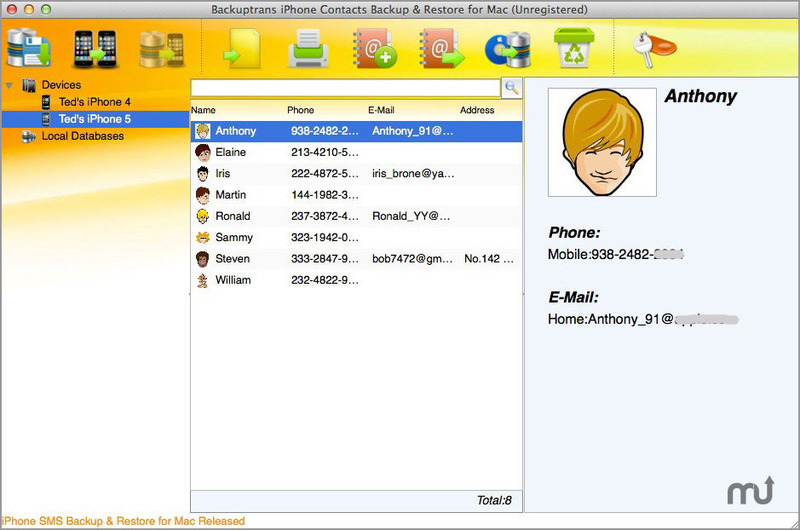 Is Backuptrans iPhone Contacts Backup & Restore really the best app in Backup category? Will Backuptrans iPhone Contacts Backup & Restore work good on macOS 10.13.4? Backuptrans iPhone Contacts Backup & Restore offers a perfect solution for all iPhone users to backup, restore and manage iPhone Contacts on Mac. It's convenient and safe. It not only supports iPhone Contacts backup to Mac, but also enables users to restore contacts backup from Mac database to iPhone, either to a new iPhone or your old iPhone, so it makes it possible and easy for iPhone users to move contacts from old iPhone to the new iPhone. Version 3.1.08: Release notes were unavailable when this listing was updated. Note: Although Finder indicates no version number for this application, the developer refers to it as version 3.1.08. Backuptrans iPhone Contacts Backup & Restore needs a rating. Be the first to rate this app and get the discussion started! You can also use it to transfer contacts between iPhone and various address books programs, such as Outlook Express, Yahoo Address Book, Google Contacts, Thunderbird, Aol Mail, Hotmail, Windows Contacts, Apple Address Book, Fastmail, Rediff Mail, Mail.com, Loposte, Orange, Skype and other address books in format of vCard(.vcf). Some iPhone users may sometimes need to export your contacts into document files. Now this has been so easy. Backuptrans iPhone Contacts Backup & Restore for Mac helps you to fast export iPhone contacts into various common document file types, including TXT, CSV, Doc, vCard, HTML or PDF. Besides, you can also directly manage your iPhone contacts on Mac, such as add, edit or even delete iPhone contacts data directly on Mac. Printing iPhone contacts is also supported with great output.